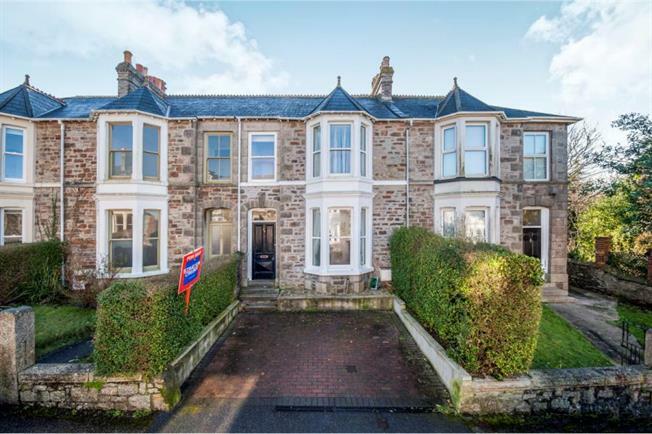 3 Bedroom Terraced House For Sale in Redruth for Guide Price £230,000. Being sold with no on going chain is this lovely period bay fronted residence. Retaining many features, the accommodation comprises an entrance hall, sitting room, dining room, kitchen, utility, downstairs cloakroom, three first floor bedrooms and a very good size bathroom with free standing roll top bath. The property has beautiful features including sash windows, tiled flooring, fireplaces and high ceilings. There is an enclosed rear garden which is laid to lawn. Doors to lounge, dining room and opening to the kitchen. Tiled flooring and stairs to first floor. Radiator. Bay sash window to the front. Open fireplace with wood mantle and tiled inset. Radiator. Ceiling cornice and picture rail. Wood flooring. Double glazed door to the rear. Radiator. Ceiling cornice and picture rail. Wood flooring. Shelved cupboard and loft access. Double glazed window to the side. Fitted with a roll top freestanding bath, enclosed shower cubicle, close couple w.c. and pedestal wash hand basin. Radiator. Ornate fireplace. Tiled walls and flooring. UPVC double glazed sash bay window to the front. Ornate fireplace. Radiator and cupboard. Double glazed upvc sash window to the front. Radiator.